February was my first full month of using Lara Casey’s Powersheets. Powersheets are designed to help you walk through setting and achieving intentional goals. Before you set your goals, you complete several pages of “pre-work.” I fully intended to have all my pre-work completed prior to January so that I could start using my Powersheets to work on my goals. Did I do that? Nope. I barely touched them and almost let them go to waste like I did last year. Watching the 2016 Powersheets Webinar, was just the kick in the pants that I needed. The webinar was so encouraging and inspiring that I approached my Powersheets and goal setting with more excitement than before. I was able to get through all of my pre-work, set my goals and plan for what I wanted to accomplish during the month of February. So what have I learned from using my Powersheets for 1 month? There are a lot of things that I love about using Powersheets. The main thing is that I am breaking down my goals into small actionable steps and tracking my progress towards completing that goal. Each month, you fill out a “tending sheet” which is where you list your monthly, weekly and daily goals along with some encouraging words or phrases. Your tending sheet doesn’t have to include activities related to your goals but I’ve found that it’s very effective to do so. When I created my tending sheet for February, I reviewed my goals to see what I would like to work on for that month. Daily goals help to build habits so I only use that section to track things that I’m trying to get into the habit of doing. Some of the habits I would like to develop are nightly journaling, praying out loud, and getting out of bed when my alarm goes off (this is really hard!). I’ve also noticed that since I’ve written down the things I want to accomplish this month, I’m more intentional about my weeks. I didn’t complete all of my goals for February but I did make progress towards most of them. I think most of that was due to seeing my Powersheets everyday on my desk and using that as a reminder of what I set to accomplish that month. I also get a huge sense of accomplishment when I’ve checked off a monthly goal or completed one week of daily goals. One of my favorite parts of my Powersheets is the monthly gratitude sheet. At the beginning of each month you start with a blank sheet. The idea is to write great things that happen to you or people you are grateful for throughout the month. Filling out the sheet as the month goes along is a much more effective way of completing the sheet. I didn’t do that in January and it was slightly difficult to remember all of the things I would consider great that happened. I referred back to my Day Designer and Five Minute journal to see what I documented as being grateful for. During the month of February, I made more of an effort to write as the month went along. When February 29th rolled around, I was so happy to have documented throughout the month. This sheet also has a section for my favorite memory of the month. Coming up with a favorite memory for January was very easy: snorkeling for the first time with my husband on our honeymoon. For February, I selected a conversation I had with my Grandpa about the importance of having ginger ale and chicken noodle soup on hand. When I think back to those two moments, I can’t help but smile. Me after snorkeling for the first time. Yesterday, I spent some time wrapping up my gratitude sheet in the February section of my Powersheets. Filling out this sheet throughout the month has been fun and rewarding. I tried experimenting with doodles and add morning color to the page. I hate to admit this but I don’t take the best care of myself. Stress often gets the best of me. Who wants to be stressed out all the time? Not me and I’m pretty sure my body doesn’t want to go through that either. To make sure I am taking better care of myself, I set a self-care goal. Part of my weekly self-care routine will involve using a face mask. I purchased some Tonymoly I’m Real face masks from Amazon. What I love about using sheet face masks is that I am forced to relax. According to the instructions, you place the mask on your face for about 20 minutes. I can’t eat. I can’t watch tv (mainly because I wouldn’t be able to see the screen without glasses). The most that I can do is lay on my bed, close my eyes and listen to some music or a podcast. The first time I tried this in January, it was amazing. The mask felt nice but I think what really made the difference was the fact that I was totally and utterly relaxed. Afterwards, I felt so recharged and ready to take on the world. Besides engaging in a relaxing activity once a week, I also want to journal more. Journalling about what I’m grateful for, what I’m looking forward to and how I’m feeling allow me to take stock of my life and what’s going on. So far I have three ways that I’ll be journalling. In my Day Designer, I write what I’m grateful for at the end of the day. The 5 Minute journal that I write in twice a day asks you to list three things that went well today and what could have gone better. I’ll also write a short summary of my day in my bullet journal (a Leuchtturm 1917 gridded notebook). Can't wait to try all of these! Planning an adventure is something I always say that I’ll do but don’t. I tend to wait until Saturday to start thinking about what I should do on the weekend. When you plan to have some adventures or do an activity you have something to look forward to. Towards the end of January, I started thinking about what adventures I could have in February. This question was a lot harder than I thought it would be. Initially the only thing I could think of was going to a masquerade themed birthday party. After some thought I also came up with going to the movies and taking a trip to NYC. The masquerade party was a lot of fun and Deadpool was hilarious (it’s a must watch; do NOT bring kids). On our trip to NYC we went to Dallas BBQ, one of my husband’s favorite restaurants in the city. I’m glad that I took time to think about the ways to have fun through the month. I did find myself really looking forward to each activity. So my first month using Powersheets has been great. I am making progress towards the goals that I set, taking better care of myself, feeling grateful for the people and things in my life, and looking forward to the adventures that are planned each month. The only downside that I see with my Powersheets is that my bag is a little heavy with my paper planner, Powersheets workbook, Five Minute journal and a book for lunch time reading. I think I could probably cut back on what I carried if I managed to write in my Five Minute journal before I left the house. Maybe I’ll add that to my daily goals and make that a new habit. Do you track your progress with goals? If so, tell me how. I’d love to know. Going into 2016, I knew that I wanted this year to be even better than 2015. Last year was filled with some amazing experiences (wedding planning, getting married, launching my workbook) and some not-so-great experiences (an ER visit days before my wedding and my paternal grandma passing away). I attribute most of my 2015 success to planning and writing my tasks in my Simplified Planner (fantastic paper planner created by Emily Ley). Up until last year, I was using numerous apps for productivity and found that NONE of them actually helped me get stuff done or track my progress efficiently. So I thought...What could I do differently this year that I didn’t do last year? The answer I landed on was using an intentional goal setting and planning product created by Lara Casey called Powersheets. Received my #powersheets in the mail today. I've been working through @laracasey's book #makeithappen and I've identified so many things in my life that I were holding me back. I know that I don't want to be the same in 2015. I want to let go of the fear that was holding me back from all that God wants me to do. I stumbled upon @laracasey's blog early last year and brushed it off. I wasn't ready to reflect on my life and make changes to it. When I came across it again about two weeks ago, I knew that this is what I needed to help make some real changes in my life. I've made it through part 1 of the book and already I feel a huge weight lifted off my shoulders. I received an unexpected check in the mail and got a call back on a business endeavor. 2015 is off to a fantastic start! #praiseGod I'm ready to #makeithappen in 2015. Can't wait to work through the #powersheets and see how these tools impact my life! I purchased Powersheets and Lara Casey’s book Make it Happen last year. Her book fired me up about making goals happen but I didn’t really use the Powersheets. Why didn’t I use them? I’ll answer that in more detail in another post but the short answer is: the format wasn’t a good fit for me. After that experience, you would think that I would steer clear of Powersheets. Why buy something a second time if you didn’t use it the first time? Well towards the end of last year, Lara Casey and her team released a spiral-bound workbook form of Powersheets. I love spiral-bound notebooks. This version was also 12 months instead of a 6-month loose-sheet paper pack. Another plus the sticker pack. Stickers make everything better. Besides the formatting changes, I was reading her blog more frequently last year and gained a better understanding of how I could use Powersheets to set and achieve my goals. One component of Powersheets that I paid particular attention to was choosing my word for the year. When you think of your yearly goals, you try to integrate your word with each goal. I’m familiar with the concept of selecting a word to align your goals and activities with. I first heard about this when reading some scrapbooking and Project Life blogs. A prominent scrapbooker and memory keeper, Ali Edwards created the “one little word” (OLW) movement. The idea is that you select one word that you will focus on for the year. I’ve seen quite a few people tweeting or blogging about their OLWs. I wasn’t sure what word to choose and felt pressured to select a good word. After praying and completing some of the exercises in the Powersheets and Lara’s goal setting series (highly recommend reading this series), I landed on a word that I wanted to focus on this year. During the planning exercises of the Powersheets, I was dealing with an unfortunate circumstance. My paternal grandmother passed away suddenly. I travelled to Ohio to attend her funeral and spend time with my family that live there. Throughout my time in Ohio legacy kept popping up. From her old journals, photos and scrapbooks that I discovered in the home she and my grandpa shared to the kinds words of family friends who spoke highly of the impact my grandma had on their lives, the legacy she left behind was loud and clear. I was a little scared to choose this word. It sounded too big and overwhelming. 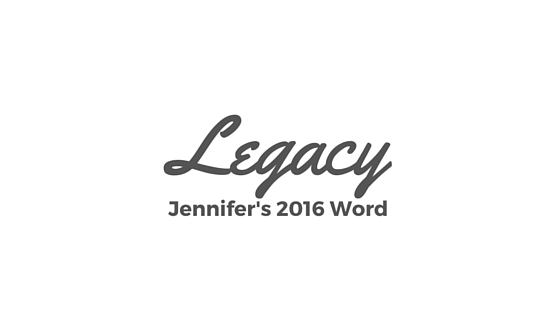 I considered trying to think of some other word and didn’t fully commit to legacy being my word of 2016. It wasn’t until I heard a podcast interview with John Lee Dumas that I realized I didn’t want to run from this word. JLD spoke about his Freedom Journal Kickstarter on a few of the podcasts that I listen to. He is the host of the popular podcast, Entrepreneur on Fire, a daily show where he interviews entrepreneurs. During one of the interviews, I listened to JLD talked about leaving a legacy. I felt like John was talking directly to me and at that moment I knew that legacy was the word for me. This word has made me think deeply about the goals I’ve set for this year. I never thought that selecting a word for the year would make such a difference. Have you selected a word for 2016? If so, let me know what your word is and why you chose it in the comments below. This time last week, I was preparing to launch my new workbook: "You Deserve Happiness Workbook: Achieving the Clarity You Need to Have the Relationship You Want." I was uploading the final pdf to the Gumroad and hoping that I wouldn't run into any issues. I scheduled my tweets and Facebook posts using Buffer (one of my favorite social media tools). I emailed my mailing list and pre-order customers to remind them about the launch. The only thing left to do was launch on August 6th. I've had time to reflect on my first product launch. In this post I'll talk about some of my thoughts regarding this launch and what I plan to do in the future. I am happy to report that quite a few things went well with this launch. I attribute some of my launch day success to creating a launch plan. Creating a launch plan was one of the assignments to complete on SPLDay8. This was an extremely helpful exercise that allowed me to think about ways to promote my workbook on my various social media accounts. I designed some images in Canva (another awesome tool) for Twitter, Facebook and Instagram so that I would have an image to accompany some of the updates that went to those accounts. When I tweeted about my launch date, some of my followers and members of the SPL community helped spread those tweets by retweeting them. A few of my friends on Facebook shared my updates with their friends. In addition to using social media, I sent an email to my family to let them know about the upcoming launch. I encouraged them to spread the word by sharing the email or notifying others of the launch. Part of this challenge was about pushing myself to try new things. Gumroad was an entirely new platform for me. I also wanted to experiment with Mailchimp. Using Mailchimp, I could manage the email list for my product and setup an email list for my blog. I created email campaigns to send out to those that followed (joined my email list) me on Gumroad or purchased my product. Gumroad has the capacity to send out emails to your customers and I did use it at first. Mailchimp offers more options for customizing the look and feel of your email. It took me some time to figure it out but eventually I established a template that I can use to build my thank you and launch day announcement emails. What could have been better? Even though I consider the launch plan that I created effective, I could have done more to promote my workbook. Promoting my product sooner would have helped. Instead of promoting my product or announcing what I was doing on social media, I didn't say much on social media. I wasn't quite sure what my final product would contain or look like. I told myself that because I didn't know those details that I should wait to promote my product. WRONG! I should/could have been more transparent and shared a behind-the-scenes look into what I was working on. I've heard other entrepreneurs on podcasts recommend creating your landing page with some basic information about your product and collecting email addresses. I was so nervous to try this strategy. I felt like I needed to know everything about my product before I could officially announce it to the world. Now I feel ok with implementing that strategy for future products. I launched this product without a dedicated audience for it. My blog hadn't been updated in months and when on social media I wasn't talking about anything dating related. I knew that I needed an audience when I started this challenge but I didn't have time to work on creating my product AND building that audience at the same time. Time was a very precious commodity and using it wisely made all the difference. Would I have liked to launch my product to a larger audience of people? Absolutely. Now, I know that I need to build my audience and draw them in. Before this challenge, I very rarely participated in Facebook groups. I had no idea how awesome they could be. The Small Product Lab FB group was very encouraging and supportive. I branched out a little bit and found some other Facebook groups that will help me to build up my audience and network amongst other bloggers, creatives, and entrepreneurs. I've heard that Google+ communities can also be a great way to connect with others and I plan on joining some of those communities. What will I do going forward? I know that I need to be consistent about growing my audience. I have a few ideas about how I can do that. One idea is to create a content plan. This content plan will include my social media presence and my blog. I've heard podcasters, bloggers and other creatives stress the importance of being consistent. Showing up when you say you will and doing the work goes a long way. Going forward I am striving to be more consistent in posting content. To help me stay on track for creating more content I realized that I need to set deadlines. The deadline for the Small Product Lab forced me to keep going even when I felt like I couldn't or didn't want to. Openly announcing that I am launching something at a specific time is another huge motivator to get things done. I am already brainstorming ideas for version 2 of my workbook and ways that I can bundle it with other content. I'm also waiting to hear some feedback from the customers that purchased my workbook. I want to make sure that my content is addressing their needs and helping them. I encourage you to try the Small Product Lab challenge. The July challenge has concluded and I think they will have another challenge next month. Follow Small Product Lab on twitter for more information. Lastly, have you checked out my workbook? I would love to know what you think. I can barely contain my excitement about the launch of "You Deserve Happiness Workbook: Achieving the Clarity You Need to Have the Relationship You Want." I thought it would feel good to launch something, but I had no idea it would feel this good. When I printed my worksheets to proof them, I realized just how far I had come. I went from a 1-sentence description of what I wanted to create to an 18-page workbook designed and created by me. The time frame was tight. The learning curve was steep. But, I did it. I sold three copies through pre-order and launched on time! I signed up for the Small Product Lab challenge not knowing what I would create and I didn't have any experience launching a product. The challenge guides you along with daily emails describing what you should focus on to launch your product in 11 days. To determine what product you should create, you think of a topic that you know something about. This could be a topic that you have a lot of experience with or something that others frequently ask you about. Based on this, I decided to create a dating workbook. Friends have asked me for dating advice and a number of times they suggested I start a blog about it. I usually shied away from the subject on my blog and social media but for this challenge the idea of creating a tool that focuses on that topic resonated with me. I created this workbook for women who feel like they won't find the right relationship. I want to encourage women to be more intentional about what they want in their romantic relationships. I thought that I wouldn't find the right relationship and became discouraged. Being intentional and knowing exactly the type of person I wanted to date empowered me to seek out that person. I created the workbook I wished I had when I was going through the dating process. Everything mentioned in the workbook, I incorporated into my life. It helped me tremendously and I think it can help others too. These past 11 days have been an exciting and challenging experience. I would recommend this to anyone that has a desire to create something but thinks they might not be ready yet. You will be surprised by how much you can accomplish in such a short span of time. Later today I will launch my dating workbook, "You Deserve Happiness Workbook: Achieving the Clarity You Need to Have the Relationship You Want." If you read my last post, you'll know that I doubted myself at first. To progress from having no idea what to create to having a product that is ready to launch, makes me extremely happy. I am so proud of myself. This challenge has been an eye-opening experience. It forced me to stop making excuses about why I can't create something. In the past, my go-to excuse was that my computer was too old and slow. I wanted to use the latest and greatest operating system and programs (specifically iBooks Author). To complete the Small Product Lab project, I had to use what I currently have and that's an old Macbook Pro running OS X Lion (v10.7). To my surprise that was enough. I feel empowered knowing that when I stop making excuses and put my mind to accomplishing something I can do it. Getting a product to launch is very intimidating especially if the launch date is a short window of time. So much to do and figure out. Without this project, I'm sure I would have taken much longer to create a product and launch it. I would have waited until I felt completely and totally ready to launch. I've heard many marketing and business podcasters repeat this quote from Steven Pressfield "Start before you're ready." It seemed liked a crazy thought to me. Why start before you're ready? Now, I get it. The difference between starting before you're ready and waiting until you feel ready is time. I spent my time much differently than I would have if I didn't have such a short deadline. I learned and focused on what was absolutely necessary. I kept my project small so it could be completed and ready for launch. A narrow focus and dedication are the main drivers in how I successfully progressed to launch day. Typing out the words "launch day" sends my emotions into overdrive. The day is finally here. Click the button below to purchase. Today marks #SPLDay5. If you're wondering what SPL stands for it means: Small Product Lab. Small Product Lab was created by Gumroad to help you to launch your own product in 11 days. I randomly stumbled upon a tweet announcing the upcoming Small Product Lab challenge (I think this is the second time Gumroad has conducted this) and signed up for the waiting list. I wasn't sure what I was getting into. I started blogging with Squarespace in 2010. At the time, several of the podcasts I listened to had advertisements for the platform. I took a chance and signed up. Designing my blog was fun and Squarespace made it very easy. The customer support helped me to understand things that I was unfamiliar with. Back then, I didn't know what to talk about so I wrote about anything that came to mind. I wasn't diligent about updating my blog and definitely didn't think about having a schedule for posting. Not having a schedule for blogging was the least of my worries. I had two big hurdles that stood in my way. Like many people, I struggle with procrastination and fear. Sometimes I'm able to leap over these hurdles and keep making progress on my goal but many times they stop me in my tracks. Thinking about my 2010 blog, procrastination kept encouraging me to put off writing until tomorrow or next week or next month. When I finally did sit down to write something, fear made me question everything I typed. Would anyone be interested? Who am I to write anything worth reading? It didn't help that I started to hate how my blog looked. Instead of focusing on writing and sharing my thoughts, I became distracted by how unhappy I was with the look of my blog. Procrastination chimed in and told me that I needed to work on everything but a new blog entry. Eventually, I stopped writing altogether. Lately, I've been thinking about how I spend my time and I realized that most of my time was spent doing things that weren't advancing or helping me in any way. Sure, binge watching tv shows on Netflix (Daredevil, House of Cards, Orange is the New Black are awesome!) is fun but after doing so, what do I have to show for it? Why was I choosing to watch tv shows and movies instead of spending time doing creative work? I listen to a lot of podcasts and some of my favorites are from creatives and entrepreneurs. Almost all of the hosts and interviewees spoke about ways to do the work that you are passionate about and fill you with joy. A recurring sentiment throughout the episodes was that you must start somewhere. If you want to be a writer, start writing. If you want to be a photographer, take pictures. Procrastination will make you think that you have to wait until you are faced with the perfect scenario to engage in your passion project. Why wait? Why not start working on it today? You can feel the excitement and joy your project brings you right now instead of delaying. After listening to these podcast episodes and reflecting on them, I knew that I must start making time for my creative pursuits. I can't change the number of hours in a day, but I can change how I spend those hours. I've started a 100-day project to improve my calligraphy. To work on this project, I had to cut back on watching my nightly tv shows. When I look at my writing samples, I feel excited because I can see improvement and I know that the more I practice the better I will become. Ideally, I want to be able to incorporate some calligraphy on the envelopes I mail out for my wedding. So less time will be spent in a passive state of consuming tv shows and movies and more time will be spent engaging in my creative interests. It took me some time but now I know what I want to use this blog for. I want to share my adventures in actively purposing my creative interests. Documenting my progress through writing will help keep me accountable and improve my writing skills. Be sure to check back and read about my adventures in calligraphy, memory keeping, cooking and wedding planning. A blog written by Jennifer Alison about her passion for calligraphy, memory keeping and enjoying life.